Mac OS X is well known for its great features, but there is always some scope for improvement. In this article we mentioned top 10 apps that power up your Mac. 1. TotalFinder – A finder plugin that offers you several useful features such as tabs, dual window viewing mode, folders on top, etc. 2. Perian – This is a free, open source QuickTime component which adds native support for many well known video formats. Perian is also known as the swiss-army knife for Quicktime . 3. Cobook – Cobook is an enhancement to the OS X address book. It keeps your contacts up-to-date by automatically looking up your social network accounts. It can integrate seamlessly with other Mac apps and can also synchronizes with OS X address book and other devices via iCloud. 4. Hyperspaces / ReSpaceApp – This lets you customize your space making different from others. You can give name to your spaces, assign different desktop pictures to each space, add labels, and assign specific keyboard shortcuts as well. It also provides tons of built-in shortcuts to manage your spaces more easily. If you want more out of your virtual desktops than OS X can provide, give Hyperspaces a try. Hyperspaces requires Mac OS X 10.5“Leopard” or Mac OS X 10.6 “Snow Leopard”. It is not compatible with Mac OS X 10.7 “Lion”. 5. ScreenSharingMenulet – It provides real time search for local and Back to My Mac hosts via built-in screen sharing functionality. You can also manually add remote computers so you can easily connect when you’re away from your local network. 6. 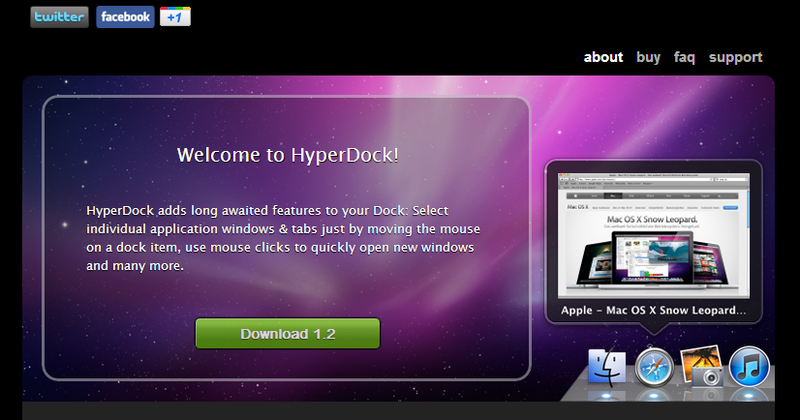 HyperDock – This enhances your dock by adding several types of awesome previews. It can preview app windows, display iCal events, and even control iTunes. This allows you to easily resize windows by holding down a modifier key and moving your mouse, can let you snap windows to the edge of the screen, and offers plenty of handy shortcuts to save you time. 7. Palua – This provides you quicker switch mode of your function keys on your Mac keyboard. With Palua, you just need one click – or one hotkey – to toggle the mode your Fx keys. 8. RestoreMeNot – This feature lets you reboot your Mac and watch all your apps restore themselves to the state they were in before you restarted. This is a system preference pane that allows you to choose which apps will not restore when you reopen them or restart your computer. 9. TotalTerminal – An enhancement to Terminal, the OS X command line app, that makes a terminal window drop down from underneath your menubar on command. You just pick a shortcut, press the relevant keys, and a Terminal window will drop down. 10. unDock – When you have a bunch of drives connected to your Mac—whether they’re mounted via the network or physically attached—it can be annoying to have to manually eject them all. UnDock solves that problem by adding a global hotkey, plus an option in your menubar, to eject them all at once.